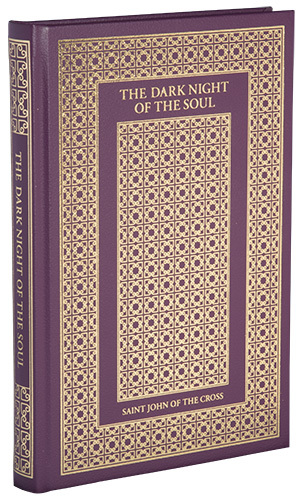 Baronius Press: The Dark Night of the Soul by Saint John of the Cross. St. John takes us on a journey into ourselves, a journey of knowledge and self understanding, that encompasses our failings and imperfections. It shows us how in a place beyond words we can embrace sadness and grief, and seeking God, our lives will be turned around. He describes the �arid and dark night of contemplation� which leads us to �the knowledge of oneself and of one�s misery.� True knowledge of our self and of our condition shows how far we must go to find God, who our restless hearts incessantly seek. The Dark Night of the Soul describes how first the senses, and then the spirit undergo a series of purgation, which aids in bringing it closer to God, and eventually preparing it for union with Him. The individual soul seeks Jesus in a mystical marriage. For after the dark night, comes the joy of mystical union with God. This edition has been re-typeset using the text of the 1916 edition originally published by Thomas Baker, London under the Imprimatur of Edm. Canon Surmont, Vicar General, Westminster, 26th March 1916. The Dark Night of the Soul is probably the best known work of the mystical tradition that flourished in Counter Reformation Spain. It describes what St. John of the Cross describes as the "arid and dark night of contemplation" which leads to "the knowledge of oneself and of one's misery." It is a product of the mystical theology of the Catholic Reformation, and yet, despite its strongly Catholic flavour, it has become a classic work of spirituality among all religious persuasions. Perhaps it is not surprising that it has attracted admirers from the Orthodox Church, who also have a strong mystical tradition, but it has touched chords in readers from Protestant, and even non-Christian backgrounds. Moreover those who are just vaguely interested in some sort of amorphous spirituality have found guidance and succour in this text. Perhaps it is the stress on St. John's own religious experience in his quest for God which allowed it to resonate with so many people, and yet this emphasis on the individual's religious quest is characteristically Catholic. Although it is a separate work, the Dark Night of the Soul continues many of the themes from the Ascent of Mount Carmel. In his earlier work he described the active night � first describing the night of sense and then the night of spirit � showing how the individual can deny and purify his or her soul, with the aid of God's ordinary grace, in such a way as to prepare his or her senses and faculties for union with God. In the Dark Night of the Soul St. John describes the passive night � and again first describes the night of sense and then the night of spirit. Here he tells us how those same senses are purged and purified by God in order to the same end, that of spiritual union with the Lord. the soul, after it has been definitely converted to the service of God, is, as a rule, spiritually nurtured and caressed by God, even as is the tender child by its loving mother, who warms it with the heat of her bosom and nurtures it with sweet milk and soft and pleasant food, and carries it and caresses it in her arms; but, as the child grows bigger, the mother gradually ceases caressing it, and, hiding her tender love, puts bitter aloes upon her sweet breast, sets down the child from her arms and makes it walk upon its feet, so that it may lose the habits of a child and betake itself to more important and substantial occupations. The loving mother is like the grace of God, for, as soon as the soul is regenerated by its new warmth and fervour for the service of God, He treats it in the same way; He makes it to find spiritual milk, sweet and delectable, in all the things of God, without any labour of its own, and also great pleasure in spiritual exercises, for here God is giving to it the breast of His tender love, even as to a tender child. One cannot help, but reflect on how these meditations on the state of the soul at the beginning of its journey towards God are strongly redolent of certain passages in the Scriptures. At first the reader probably thinks of Psalm 130, where the Psalmist declares, "I have calmed and quieted my soul, like a child quieted at its mother's breast; like a child that is quieted is my soul" but St. John does not leave us here, with the soul happily caressed, but moves us on to the experience of maturity in God, and in Our Lord Jesus Christ. This is what St. Paul also tells the first-century church in Corinth that it needed to do. He complained that "I [�] could not address you as spiritual men, but as men of the flesh, as babes in Christ. I fed you with milk, not solid food; for you were not ready for it; and even yet you are not ready". The soul commences its dark night when God draws it forth from the state of infants (which is those who already meditate upon spiritual matters) and begins to set out on its journey onwards, to actually enter into a life of contemplation. Contemplation is part of the key to arriving at the journey's end which, as in St. Teresa of Avila's Interior Castle, is the union of the soul with God. God, wishing to humble the children of Israel and desiring that they should know themselves, commanded them to take away and strip off the festal garments and adornments wherewith they were accustomed to adorn themselves in the Wilderness, saying: "Now from henceforth strip yourselves of festal ornaments and put on everyday working dress, that ye may know what treatment ye deserve." This is as though He had said: "Inasmuch as the attire that ye wear, being proper to festival and rejoicing, causes you to feel less humble concerning yourselves than ye should, put off from you this attire, in order that henceforth, seeing yourselves clothed with vileness, ye may know that ye merit no more, and may know who ye are." Wherefore the soul knows the truth that it knew not at first, concerning its own misery; for, at the time when it was clad as for a festival and found in God much pleasure, consolation and support, it was somewhat more satisfied and contented, since it thought itself to some extent to be serving God. So the soul has to strip itself of its "festal garments" in order to make progress towards God in the dark night of the soul. To many readers this may suggest the passage in Philippians where we are told that Jesus 'stripped himself' of his divinity in order to progress towards the humanity which he had created and be born among us. In as much as God here purges the soul according to the substance of its sense and spirit, and according to the interior and exterior faculties, the soul must needs be in all its parts reduced to a state of emptiness, poverty and abandonment and must be left dry and empty and in darkness. However, despite this stress on the all embracing grace of God, in the Dark Night St. John stresses that by our own efforts, even if aided by the ordinary graces that surround us every day, we cannot purify ourselves. Only through the extraordinary grace of God saturating the soul can we achieve purification. "However greatly the soul itself labours, it cannot actively purify itself so as to be in the least degree prepared for the Divine union of perfection of love, if God takes not its hand and purges it not in that dark fire." The Saint also meditates on the imperfections of which we need to be purged, examining them at some length in this part in chapters two to seven, where his examination of these faults reflects the traditional order of the seven deadly sins. In the second book, the Saint looks at the dark night of the spirit and at what time it begins. After the soul has come through the aridities and trials of the first purgation (which occur in the night of sense) it is possible that it will not enter the night of the spirit for a long time, even for years. Yet the purgation of the soul is not complete after the night of sense, although it will go about the things of God with greater freedom and a sense of satisfaction. The night which is to come will dispose the soul to the most profound love of God, even though when the spiritual night commences this will not be felt, as the fire of God's love has yet to take hold. However, John describes how God gives the soul "an estimative love of Himself": so from the first twilight that announces this night the soul will be touched with the yearnings for love. without delaying an hour or waiting for another time and season, she could reach Him for love of Whom her soul was already wounded and enkindled. And such is the inebriating power and the boldness of love, that, though she knew her Beloved to be enclosed in the sepulchre by the great sealed stone, and surrounded by soldiers who were guarding Him lest His disciples should steal Him away, she allowed none of these things to impede her, but went before daybreak with the ointments to anoint Him. This "inebriating power and yearning of love" moved her to speak to the one she thought was the gardener, who she thought had taken the body of Him from the tomb. As John points out, the question was foolish. If this had have been a gardener who had stolen the body he was hardly likely to have told her where he had moved it to. Moreover it was highly unlikely that the gardener would have done such a thing. But this is unimportant. The power, nay the vehemence of love, is characterized by the belief that all things are possible, and that all will be of the same mind as itself. Echoing St. Paul's famous passage in 1 Corinthians 13 that "Love bears all things, believes all things, hopes all things, endures all things." What love seeks is everything, and it believes that there is nothing else to be desired, nothing else to be pursued, except the source of its quest. Upon my bed by night I sought him whom my soul loves; I sought him, but found him not; I called him, but he gave no answer. "I will rise now and go about the city, in the streets and in the squares; I will seek him whom my soul loves." I sought him, but found him not. The watchmen found me, as they went about in the city. "Have you seen him whom my soul loves?" Except that which in my heart was burning. Oh night that was my guide! Oh darkness dearer than the morning's pride. Transfiguring them each into the other. Threw them amongst the lilies there to fade. Since St. Bernard, the Song of Songs had been seen as an allegory of the love between Christ and the Church. So it is that St. John can draw on its material and use it as part of his epic of mystic theology in which the individual soul seeks Jesus in a mystical marriage. For "The soul sees naught, neither looks at aught neither stays in aught that is not God, to the end that it may reach Him, inasmuch as it journeys unimpeded by obstacles of forms and figures, and of natural apprehensions, which are those that are wont to hinder the soul from uniting with the eternal Being of God." Nothing less than this mystical union is the purpose of the dark night of the soul.